or.. you could use this as a “liner” for a discarded plastic or other bottle if the cleanliness of the bottle is unknown. 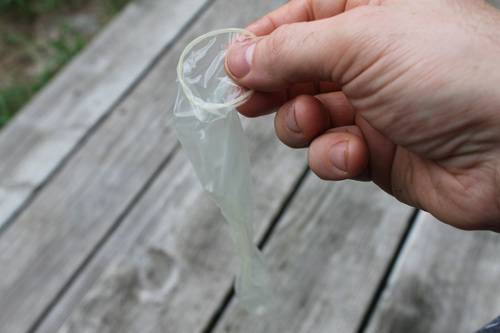 Condoms also are great for protecting your gun barrel from dust and water when out hunting or in the field. They also can be used to make fire (a future article). 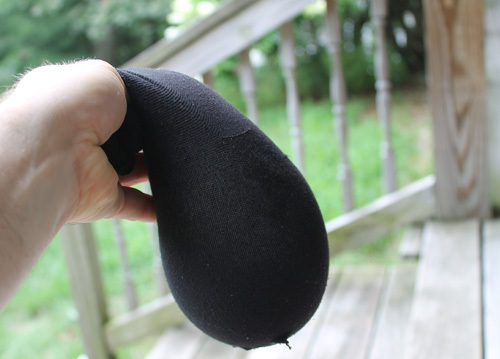 If you wet the sock and allow air movement to get at it it will chill it too. Evaporative cooling is an excellent tip for this type of water bottle Thanks! Innovative concept and good ideas in the comments by Wayne and Sandy. Thanks! I second that. Thanks you guys! This is a good idea. I had a few thoughts: You could also use latex gloves, too. Also, if you’re doing this ahead of time, you can purchase non-lubricated condoms. Finally, for those with latex allergies, non-latex condoms or gloves would have to be used. Having had 3 daughters in the house, all grown now thank god, I’ve found that knee high nylons have many uses. Lining one with a condom makes a great emergency water bottle and takes up less room than a sock. Just a thought. Thanks for the tip Hollis! Balloons don’t work well for bodies of water (what you’d most likely encounter in the wild) since there isn’t enough pressure to fill them. As I was reading this I was wondering what you intended to do to keep your ‘bottle’ intact as they are in no way designed to hold water. The sock would probably work great. Yeah, for traveling you definitely need the sock, however if you’re just gathering, disinfecting, and drinking in the one location there’s little chance of bursting the condom. ALWAYS BUY THE MAGNUM SIZED CONDOMS FOR WATER , HECK IF THE WOMAN FIND THEM THEY WILL BE IMPRESSED ! Great idea….especially the sock…thanks for the insight. A collapsible water bottle would be more practical. I originally thought of that but carrying it around everyday would still be a pain (for me at least). I needed something very low profile that I could wear without anything “printing” on my clothing. The collapsible bottles I found — even when collapsed — were still too bulky for me. If you know of another one that is pretty low profile (something that would fit in your pocket without it being noticeable) I’d appreciate a link. I suppose a few of these in your “trade” kit would be handy also. I can imagine, in a long term disaster situation, that any birth control method is going to be in demand. Just be sure to rotate them, if you don’t, ahem, indulge. i want to thank you for the great vids you have sent to my email.i have shown them to my prepper buddies. i am retired army and i can tell you this, your video,s are a big help,thanks. LMFAO @ cj06 That’s a very good point. I know I’ll never have a problem with water or wilderness survival, but I’m gonna carry a huge condom on me, from now on, thanks to your comment.